Three words. Bleh, bleh, bleh. That's right. Although I missed out on my chance to catch Hotel Transylvania with the Nuffies during the Nuffnang contest, I decided that I just HAD to watch it on a different day. And boy did I make one of the best decisions to watch this on the big screen. 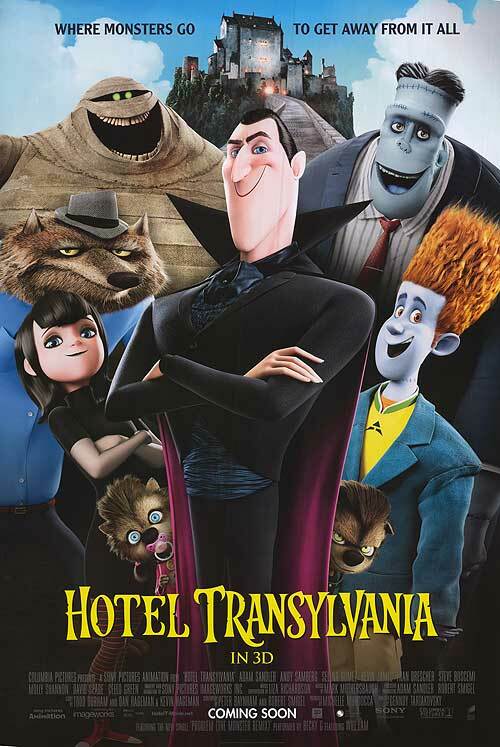 So what about Hotel Transylvania that caught my attention? It really didn't help that it was an animation and I am a dead sucker for animated movies. So sue me, I'm grown up by age yet childish in my heart. The trailer offered me quite a lot to grab just sufficient attention that I had to bug the all annoyed boyfriend of mine to take me out. All the same, the storyline begins with Count Dracula; whose wife was viciously murdered by a group of irrational humans YEARS ago. In order to protect his one and only precious daughter, Mavis, Count Dracula decides to build a hotel far away from the existence of humans. Of course, seeing as that every other monster around the world has their tough times, Count has decided to share. That's when all other monsters in the world comes together for their very own getaway. What happens when a lost, clueless and havoc wrecking human comes to this secluded hotel one day? They go wiggle, wiggle, wiggle YEAH. SPOILER STARTS HERE. Being noted in huge, bold and red letters just so you would notice it and you wouldn't say that I'm a witch for showing off. And just in case you're really reading this, click here for an extremely cute GIF I came across while being on Google for Hotel Transylvania pictures! 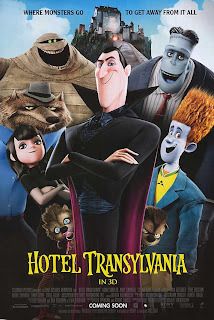 What's enjoyable about Hotel Transylvania has got to be the way that the movie has been set in such ways that you will find fun being poked at especially at LMFAO and it's hilarious reference to Twilight! Of course, expect to see certain heartwarming scenes between Count and Mavis as their father and daughter relationship goes. Enjoyable quotes galore leaves this movie to be one of the best movies I've watched this whole year and I have found the ability to discuss about it with some of the most unexpected friends! Then again, expect certain scenes where little children MAY or MAY NOT be scared at the sudden change of Count's reaction towards humans. Otherwise, you'd be seeing a forever smiley Count and you just can't stop enjoying his movements. Adam Sandler pulls of the Count accent in such an adorable way that you really can't help but to love him especially in his goofy moments. Other mediocre features includes Selena Gomez as the all round curious Mavis, Andy Samberg as the backpack loving human Jonathan. Kevin James as the cheapskate Frankenstein, Steve Buscemi as the insomniac Wayne Wolf and CeeLo Green as the fat and goofy Mummy. A definite special mention should belong to the crazy Chef Quasimodo voiced by Jon Lovitz. I swear, that is one mad chef. Definitely a movie worth catching whether on the wide screen or through a later DVD release. If anything else, believe me, I didn't do that. Because; bleh, bleh, bleh! "A wooden stake to the heart? Who wouldn't die from that?"